Existing studies reveal that high levels of sedentary behavior are associated with more inattention and hyperactivity problems. 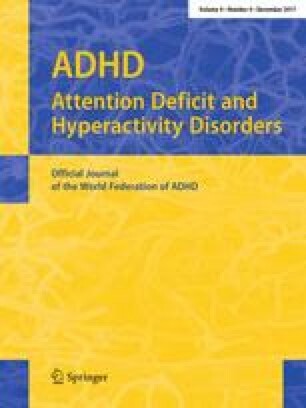 Since most previous studies used screen time as an indicator of sedentary behavior and assessed symptoms of attention-deficit/hyperactivity disorder (ADHD) by short screening measures which do not allow to distinguish between subtypes of ADHD, the current study aimed to investigate association between different types of sedentary behavior and symptoms and subtypes of ADHD. The current cross-sectional study analyzed data of 913 students (46.1% girls) aged 13–17 years (M = 15.0, SD = 0.6). Using a self-administered questionnaire, screen-based and non-screen-based sedentary behavior and ADHD symptoms were assessed. Linear and logistic regression analyses were conducted. All analyses were adjusted for age, gender, moderate to vigorous physical activity and body mass index. Screen time was related to the total ADHD score (p < 0.001) as well as to the subscales inattention (p ≤ 0.016) and hyperactivity/impulsivity (p ≤ 0.008). Sedentary time without screens was virtually not associated with ADHD. As far as ADHD symptoms are considered as a correlate of sedentary behavior, the type of activity which is pursued sedentarily seems to matter: screen time, but not other non-screen-based sedentary activities should be considered as being a risk factor for ADHD. The “läuft.” trial is a cooperation project between the läuft Study Group, “Institut für Qualitätsentwicklung an Schulen Schleswig-Holstein” and “Landesvereinigung für Gesundheitsförderung in Schleswig-Holstein e. V.”. The läuft. Study Group: Franziska Clemens, Reiner Hanewinkel, Julia Hansen, Barbara Isensee, Maike Johannsen, Vivien Suchert (Institute for Therapy and Health Research, Kiel, Germany); Claus Krieger, Katrin Steinvoord (University of Hamburg, Germany); Ingeborg Sauer, Burkhard Weisser (University of Kiel, Germany). We wish to extend special thanks to Malin Bachmann, Martin Bäuning, Anja Biehler, Teresa Frerichs, Christina Helling, Leonie Herde, Stefan Homann, Toska Jakob, Christiane Kampen, Jacqueline Kloß, Corinna Köhler, Alexandra Krahl, Hanife Özbek, Esther Pohanke, Sina-Aline Reck, Luise Rehermann, Eva Schulenburg, Jessica Schwarz, Inken Tödt and Nadine Witzel who supported us in data acquisition as well as to the teachers and students that participated in the study. The “läuft.” physical activity trial was funded by German Cancer Aid in the Priority Program Primary Prevention of Cancer (Nutrition and Physical Activity, Reference Number: 110012). After a positive decision on applying for study support, the German Cancer Aid did not influence the collection, analysis or interpretation of data or the writing of the article and decision to submit it. All procedures were in accordance with ethical standards of the institutional research committee and with the 1964 Declaration of Helsinki and its later amendments or comparable ethical standards.